Album launch: Mary MacKillop College students (from left) Tiffany Visser, Gabby Walters, Alice Simpson and Mattea Vickary with Josephite Sister Janet McDougall, Heartbeat songwriter Mary Fletcher and principal Christine Clarke. FRIENDS, old and new, were encouraged to “listen to the heartbeat of the world” during feast day celebrations at Mary MacKillop College, Nundah. To celebrate its patron St Mary of the Cross and the Sisters of St Joseph, the college launched a new CD featuring a song written by teacher Mary Fletcher. 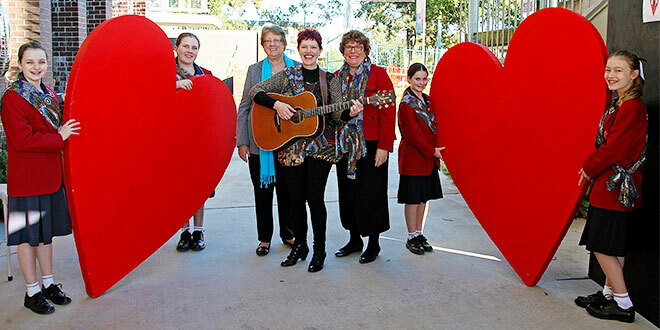 Ms Fletcher wrote the song Heartbeat to celebrate the Josephite Sisters’ sesquicentenary year with the lyrics encapsulating the best values of the sisters and what the community of Mary MacKillop College stands for. She said the words were inspired by the sisters’ sesquicentenary logo for the special occasion: “Listening to the Heartbeat of the World”. Ms Fletcher said the song was for everyone, a song to unite the world. The CD features two tracks – the first a recording of Heartbeat, performed by the college’s eCCCos choir, and the second is an instrumental version of the song that others could sing along too with the help of the backing track. Formed in the late 1990s, the eCCCos singers were the school’s longest-running vocal group, who concentrate on performing a collection of original and contemporary songs about social justice and values. Choir member Grace-Rita Thetadig said being part of the Heartbeat launch was the culmination of a lot of hard work. The Year 12 student said the song felt like it had been written for the group, especially with this being a special Year of Mercy. “It’s a very meaningful song; it has a lot of truths in it and I think everyone can relate to it,” she said. Former Mary MacKillop College principal Josephite Sister Janet McDougall said it was fantastic to be part of such an historic occasion both for the college and the sisters. “I want to emphasise the gift that Mary Fletcher and her music has been to the Josephites and to the spread of the Josephite spirit throughout our schools and Australia,” she said. The CD features a unique cardboard packaging, a deliberate choice by the college to make it carbon neutral. Making it cardboard and not plastic saved more than one kilogram of carbon dioxide for each CD produced and the college will also plant two native trees for each CD produced. Principal Christine Clarke said this ensured that, in the words of the song, “we are being stewards of creation and its gifts”. To buy the CD go the Mary MacKillop College website www.mmc.qld.edu.au.